This was written by Elizabeth in June, 2010, 17 months before she was diagnosed with lymphoma. She was preparing to leave Tucson for Seattle. She did not consciously know she would die just over 2 years later, though some part of her clearly did. The image is the artwork on which she based the tattoo on the back of her right thigh. She loved this tattoo and was only able to get the outline completed before she was diagnosed. Once she started chemo in November of 2011, she was advised to wait until chemo was completed to have the color done, and the tattoo was never finished. 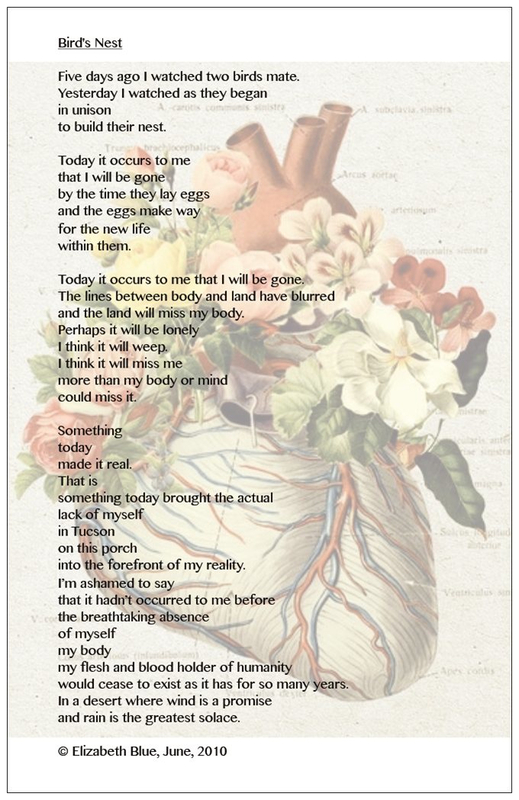 This entry was posted in All Posts, Elizabeth Blue's Poetry and tagged death, Inspiration, intuition, Life, Personal, Spirituality, Tucson by Lucia Maya. Bookmark the permalink. Wow, Elizabeth lives on. This is stunning and a profound gem for humanity to stand in awe of. Beautiful words from a beautiful soul. Thank you Dale. She was a visionary for sure… I am looking forward to having more time to read your blog, I have found it very moving and much I can relate to. I dont remember exactly how I came upon this blog. My boyfriend recently and suddenly died related to complications with a rare cancer he was not diagnosed with until he was on life support and unable to communicate with us. I did not even realize the girl in the blog would be from Tucson. I feel like I was guided to this page. Thank you for sharing your experience. Incredible insight. Beautiful poem. I am happy Elizabeth was able to experience Seattle for bit. Seattle is one of my favorite places. Its just 3 hours to the North of me. Thanks, it’s one of my favorites and brings me comfort whenever I read it. She loved Seattle too! Elizabeth,a deep,feeling being who knew what she knew without flinching.What a beautiful womyn and spirit.Thank you Lucia for sharing so much with us. I found your blog via Fransi at 365 (and counting) who nominated you for the Versatile Blogger Award today. I’m deeply touched by your daughter’s poem and the beauty of her writing but even more by her strength and courage. Your love for her is felt by all who visit. I do believe her energy lives on. I’m looking forward to digging deeper into your blog. Thank you so much for sharing your daughter’s story with all of us. Thank you so much! I am grateful that you have been touched by her poem and by the love. Glad you’re here and thank you for your comment! Thank you. I enjoy yours as well! This is my first award nomination, so I’m not sure what to do next – do I get notified of something else, or do I just follow what you’ve done? Thank you! A beautiful piece from a shining star. Elizabeth was a true wonder. Thank you – I agree! She was a gifted poet, and as she said, the poetry came through her, and she took no credit for it…but she did open herself to be a clear channel for it, and that takes some doing! It takes a special person to become vulnerable enough to share the contents of their soul. I can’t stop thinking about this, about what she was saying. See, the world needs us. I think we are born and we die but our bodies are the way consciousness is expressing itself. Consciousness/Life/Spirit doesn’t die. But what is this world if we can’t see it? The world needs us to see it to exist; and what this world needs is people who see it like Elizabeth does. I’d like to post her poem on my blog, if you’d let me and if I could figure out how. Let me know what you think. Absolutely, I’d love for you to share her work. I know part of my work is to help her writing get out in the world! I think you can “reblog” it through WordPress. it should be an option, for me it’s at the top of the screen. I love her line about her body being her “flesh and blood holder of humanity”. I also believe our consciousness lives on. I do still feel and experience Elizabeth’s presence. Sometimes through a subtle feeling or sense, sometimes she communicates clearly through music, which I’ll write about soon. I’ve heard many stories from others whose lives Elizabeth has continued to touch since she left her body. Her friend calls it the EB (Elizabeth Blue) effect! And she was HOW OLD when she wrote this?? What an old, beautiful soul. She has her wings, you know. I’ve not read the whole blog. I’m starting now, beginning to end. This one she wrote when she was 20. I agree, an old and beautiful soul…Thank you for reading! Thank you. I’m so glad you found me and led me to your blog too! Thank you, Lucia for sharing your daughter’s beautiful poem. It was an honor to read it. She certainly was a beautiful soul–maybe even an angel sent here for a special purpose. I look forward to following you and learning more about Elizabeth and your journey together. The video celebrating her life touched me deeply, thank you again. Dear Lucia,i arrived here from thoughts on a page….the poem is incredibly open,honest and confessional…so strange to hear the thoughts of your daughter,a person i never knew,speak directly to my own thoughts…as if i were the first and only person in the universe to hear them.Astonishing .Mark of a great writer and someone looking directly at their soul in a mirror.You more than shine as a parent and a friend to this special person.Thanks. I followed you here from MyThoughtsOnAPage. Thank you for sharing this. I was deeply moved by her poem. And by your responses here. Love is such a blessing. Thank you. Thank you for coming and reading my blog and for your comment. I am grateful that her poem moved you, and hope you will be able to read some of her other poetry as well. Thank you and blessings! I will certainly do this. Thank you for sharing her with us. I hope you all take some time out to read this magnificent piece. It was written by a very talented young girl of twenty, about leaving Tucson. Just over two years later she died from cancer. The writing in this is extraordinary, but it is all the more poignant reading it when we know Elizabeth is no longer with us. Her mom has a beautiful blog celebrating and remembering her very talented daughter. This is such an extraordinary poem. I read it the other day and I love it. Would you mind if I reblogged it on my site? I would love to share it. I’d be happy and honored for you to share it! I would love her poetry to reach more people. Thank you. On a side note – Elizabeth’s father’s family is Irish (Meagher) and her visit to Ireland at age 15 was a highlight of her life! A good strong Irish name! Way the Truth and the Life and no one comes to God the Father except thru Him. The hope is that Elizabeth discovered this truth and is in Heaven now! May God comfort you with these words. thank you for your comment about my daughter’s poem. From what I saw, she did not suffer, and did not have almost any pain throughout her process. I feel that that poem, Bird’s Nest, was a way of letting the rest of us know that she knew (on some deep level) that she was going to die. I do believe she is in heaven, she is completely at peace, and her consciousness has become unconditional love; she is with the divine, and present with all of us. She is Love. Thank you for reading it and for finding my site. Blessings to you. Oh thank you for this instant YES and tears- I love Elizabeth’s poem! Thank you for reminding me with your daughter’s poem that she and we are of Earth and Sky and they are part of us and Beloved always be. Thank you for reading her poem and for your beautiful response! Yes, we are of the earth, the land, and as it misses Elizabeth, so do we! A starkly, bright lit poem. Blue clarity and a direct eye on the nest of life and death. So beautiful and embracing of the unknown; a window from which the precipice ends. What courage to articulate THIS. Thank you for sharing Elizabeth’s work. Sitting in astonishment.